Master O’ong Maryono was born on July 28, 1953 in Bondowoso, East Java, Indonesia. His given name was Sumaryono, but since childhood he used the nickname given to him by his friends. Master O’ong Maryono began learning pencak silat Madura and Bawean at the age of nine and later practiced Kuntao. His first master was his grandfather, Matrawi, who introduced him to the style Macan Kumbang. Later, he became a member of the Elang Putih school. When pencak silat became a competitive sport in 1973, Master O’ong Maryono started his career as “fighter,” winning the regional championships in the regency of Bondowoso. In the same year, he moved to Jakarta where he also practiced karate, judo, aikido, ju jitsu, and tae kwon do, in addition to pencak silat training with Masters Hadimulyo and Bambang Anggono of the Keluarga Pencak Silat (KPS) Nusantara. During his life, Master O’ong Maryono helped promote KPS Nusantara techniques and established chapters of KPS Nusantara in many countries. For this and his many other contributions to his perguruan (pencak silat school), he was awarded on July 28, 2012, the white belt as Pendekar Paripurna/Dewan Guru (Grand Master), the highest level in KPS Nusantara. From 1979 until 1987, Master O’ong Maryono won many national and international competitions. 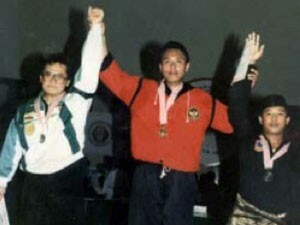 Among his international achievements, he twice became world champion pencak silat in 1982 and 1984 in the free class. He also won first prize in the same category in the South East Asia Games XIV held in 1987 in Jakarta. Between 1982 and 1985, Master O’ong Maryono also dominated the national Tae Kwon Do competitions as champion in the heavy weight class. After he concluded his career as an athlete due to age constraints, Master O’ong Maryono played in martial arts movies in Indonesia, including Tutur Tinular, Jaka Swara, and Saur Sepuh. Starting in 1997 he also began to teach pencak silat internationally in Brunei Darussalam and later in Holland, the Philippines, and most recently in Thailand, where he coached the Thai national team in various SEA Games and world competitions, as well as opened his own school. In the early 1990s, Master O’ong Maryono launched a new profession as a freelance writer and researcher on martial arts. 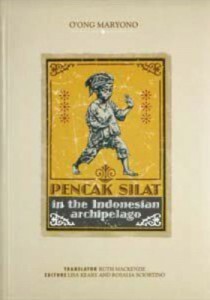 In 1998, he published a book entitled Pencak Silat Merentang Waktu (literally “Pencak Silat Stretched Across Time”) on the socio-cultural aspects of pencak silat and its historical development, which was translated into English as Pencak Silat in the Indonesian Archipelago. Both versions received wide public recognition and have become main sources of knowledge on pencak silat. He also worked on a illustrated manual of KPS Nusantara techniques that has been published in November 2015 by Silkworm Books with the title Pencak Silat for Future Generations. Towards the end of his life, Master O’ong Maryono was responsible for public relations at the International Pencak Silat Federation (PERSILAT) and was a founder and the Chief Governing Officer of the Lembaga Pengembangan dan Pelestarian Budaya Indonesia (Association for the Development and Conservation of Indonesian Culture). In his effort to preserve and develop pencak silat as part of Indonesian cultural heritage, he initiated and inspired many activities, including co-funding the Forum Pecinta dan Pelestari Silat Tradisional (FP2ST) and its electronic forum Sahabat Silat or Friends of Silat and contributing to the launching of the Pencak Silat Malioboro Festival. After a brave fight against cancer of the appendix, Master O’ong Maryono died in Singapore on March 20, 2013 embraced by his wife, Rosalia (Lia) Sciortino, and surrounded by his family and friends. A year later, O’ong Maryono Pencak Silat Award was established in his honor to support the preservation and development of pencak silat.